Pedigree collapse in our own family tree is inevitable. Charles II of Spain (1661-1700) was a product of it to an impressive degree. 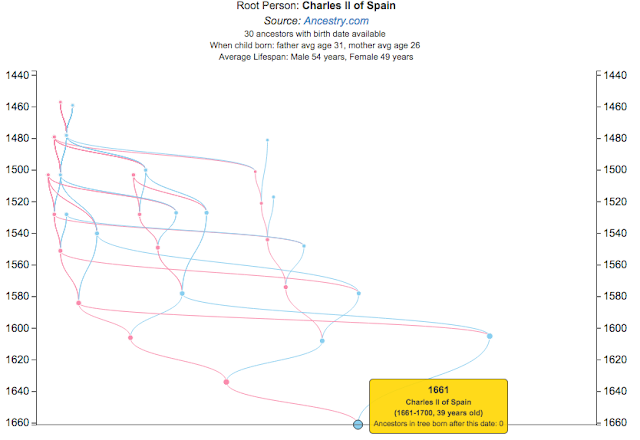 I had seen a variety of trees showing this, but wanted to incorporate his tree into the "chronologically" family tree visualizer I've been playing with. I couldn't find a GEDCOM file that included much of his tree, so I just created a tree on Ancestry.com (using this wiki page as a reference) and exported it as a GEDCOM file. A screenshot of his tree is below (including a link to the interactive tree if you want to view more details on it). The infertility assumed to be (at least partly) due to this inbreeding led to the downfall of the 200 year old Spanish Habsburg dynasty - he left no heirs, and the dispute over his named successor led to the War of the Spanish Succession (wikipedia).